A very recognizable load, this Sellier & Bellot copycat round actually exceeds most of the producer’s specifications that made this round what it is today. 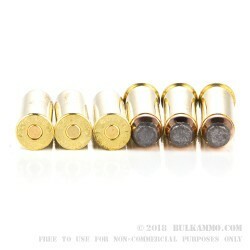 The semi-jacketed soft point lead projectile weighs 240 grains and tops a brass case with a Boxer primer that offers a non-corrosive shooting experience. 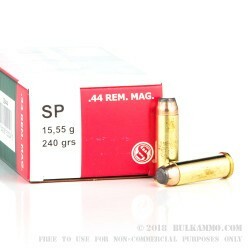 This 44 mag ammo is a great choice for the shooter looking to get a lot of value. The quality of the Sellier & Bellot offerings is very consistent across the board, with the price point being slightly lower than competitors but not the bottom tier of offerings. Yes, it’s an imported cartridge; No, it’s not a cheaply made import model. This is a legitimate manufacturer that utilizes high quality components and has a good portfolio of products that cater to the American shooting market. 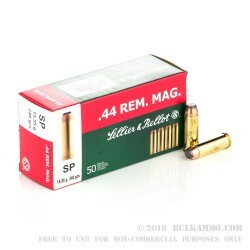 The .44 Remington Magnum round that is offered in this BulkAmmo SKU is a straightforward, plain jane round that has been used for everything from law enforcement to hunting to personal defense and everything in between over the years. It has a proven track record of performance. A velocity of 1181 feet per second and a robust 743 ft. lbs. 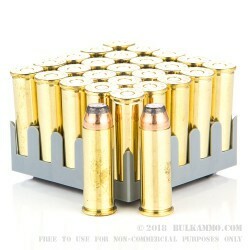 of kinetic energy makes this round potent enough for anything you would source a .44 Magnum for. The high deformation bullet makes it particularly attractive for those who want traditional performance but modern engineering and components.